Stir all ingredients with ice. 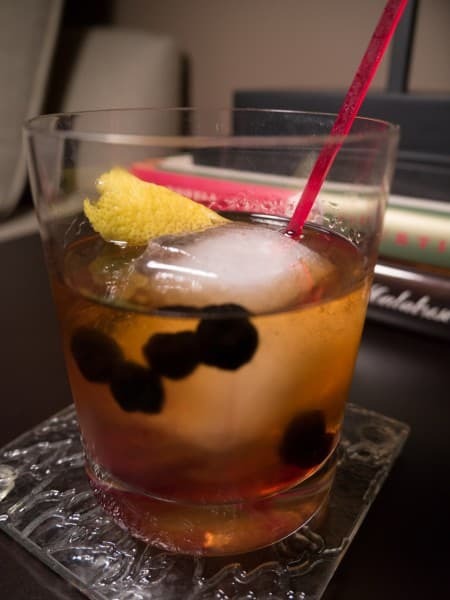 Strain into a chilled Old Fashioned glass. Garnish with a lemon or orange twist. The Old Fashioned cocktail came about in the late 19th Century when cocktails were getting fancied up with liqueurs, fruit and more exotic glassware. The old timers wanted their more plainly built cocktails that they used to enjoy in earlier years (1850's to 1870's) so they would call out for "an old fashioned whiskey cocktail" to their bartenders. The name caught on and it's quaint to think that drinks in the 1890's were so "modern" that bartenders and their customers had to invent and name a class of cocktails from earlier in the century. These traditionalists wouldn't know what to think of where cocktails went in the following century. The true Old Fashioned is made with sugar as that is how you sweetened a drink before the advent of syrups. I have a particular liking for gum syrup in this drink so I am taking a liberty in using it. The mouth feel, warmth and viscosity that the gum imparts to an Old Fashioned is appealing. If you use sugar, dissolve it in a little water first in the mixing glass. You can measure the syrup but a lot of it will just stick to the measuring spoon. Another method is to just pour the syrup by eye into the glass. Just slowly pour until the syrup is the size of a nickel in the bottom of the glass. It will spread out to the size of a quarter or a little larger on it's own. The above bitters mixture is my standard recipe. Bitter Truth Old Time Aromatic Bitters also is a good choice (by itself or along with orange bitters). Your base spirit can be rye or bourbon - your choice. You can stir this drink in the Old Fashioned glass if you want. If I do this I use 2 inch ice cubes with a Tovolo King Cube Ice Tray. I run one under cold water briefly to melt off the outer layer. This gets rid of any "funk" your ice might have picked up in the freezer while also rounding the corners a bit. The cube will usually crack but will not fall apart. One of these is perfect for an Old Fashioned, especially if you linger on the drink and/or make a double. Originally this drink just had a lemon or orange peel for a garnish similar to other cocktails of the time. This evolved into an orange wheel and maraschino cherries sometime in the 20th Century. When, I'm not sure but as late as 1935 The Old Waldorf-Astoria Bar Book only had a lemon peel garnish. If you watch Don Draper make an Old Fashioned on Mad Men he is muddling a cherry and tossing in an orange slice on top of the drink. He's also using club soda which made it's appearance along with the fruit. I'm not sure how accurate Mad Men is on this subject but at the latest we can say the fruit salad version began appearing in the late 1960's to early 1970's (the 70's is where a lot of drinks go to die). I used to make the fruit salad version in college, muddling the orange and cherry into a mess. But it tasted good and it was one of the first drinks that got me stoked on bitters. Now I dial the fruit back but will occasionally add some house made cocktail blueberries or cherries to the finished drink. If using sugar, a nice touch is to leave a cocktail stirrer in the glass. Sometimes the sugar doesn't fully dissolve and the customer can stir the drink if they choose to dissolve all of the sugar.